Jackson Outfitters Hunting & Guiding Services offers exhilarating archery, black powder, and rifle hunting experiences on the Western Slope of Colorado. 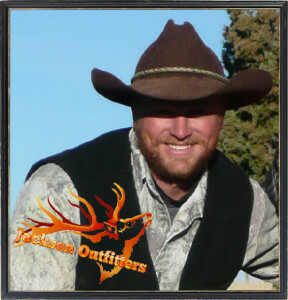 Owner and operator Roy Jackson is a 37 year old charismatic, licensed outfitter and experienced, energetic guide who has hunted these areas for over 25 years. An ardent hunter, Roy loves the outdoor quest involved in any hunting adventure, and the camaraderie of others who are enthusiastic about hunting. Roy’s ever-growing following of clients is a testament to his skill and passion for sharing the hunt!. The Jackson family has a proud history of guiding and outfitting for hunters on the Western Slope of Colorado, a family tradition spanning 4 generations and counting. Roy Jacksons’ father, grandfather, and great grandfather have all guided and/or provided outfitting services in the area since just after WWII. Today, Roy Jackson carries on this family legacy with the same enthusiasm and attention to quality services provided to hunters by the Jackson family for nearly 70 years. In 1946, Roy’s great grandfather, Comer Jackson, and his grandfather, Howard Jackson, began taking primarily deer hunters into the Rubidoux Canyon area in Western Colorado, and continued to do so for approximately a decade. Comer ran the camps, while Howard ran a twenty horse pack string carrying supplies to the camps. Howard also procured meat in his dad’s potato cellar on California Mesa near Olathe Colorado. A cold water spring ran through the cellar, enabling it to be used like a cooler. The meat was then picked up by the hunters to be taken to their homes. Howard JacksonEnjoying a day of fishing on Grand Mesa with his family (circa 1980’s). Among his other outdoor talents, Howard was aslo an avid fisherman who almost always caught a big one every trip. The pack string Howard and Comer used was composed of non-broke horses, supplied by a neighbor each hunting season. During the hunting season these horses were used until well broke, and at the end of each hunting season, the horses were taken back to the neighbor, who then sold them. Howard rode a half Percheron, half American Saddle Horse gelding to lead the pack string. Later on he also had a half Belgium, half saddle horse which packed the perishable cooking supplies, contained in two wooden cook gear boxes. The boxes had drawers, and were carried one on each side of the pack saddle. This horse was used on the end of the string, with the untrained broncs in between. The soft, non-perishable equipment, bed rolls, etc. were packed on these animals. The meat was hauled out 18-20 miles on horseback to the cellar during the cool night hours to assure that the meat arrived in prime condition. Comer and Howard continued to guide during both the early and late seasons well into the late 1950’s. 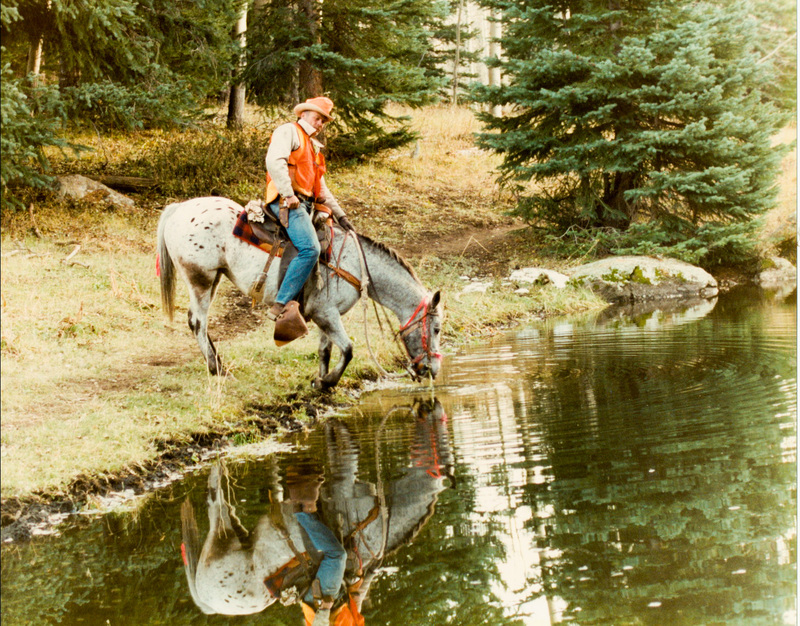 Dave JacksonTaking a moment to let his horse drink water during a hunt he was guiding on Grand Mesa (circa 1990’s). 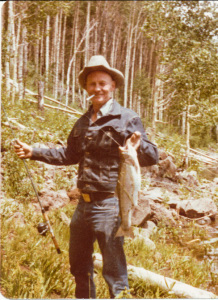 Roy’s father, Dave Jackson, has also been an outdoorsman his entire life. Around 1968, at sixteen years of age, he began taking hunters out deer hunting in the area around the east rim of Rubidoux Canyon. He continued to guide friends and family yearly until 1994, when he guided professionally on the Grand Mesa for Eagles Nest Lodge, assisting primarily out of state hunters procure deer, elk and bear. 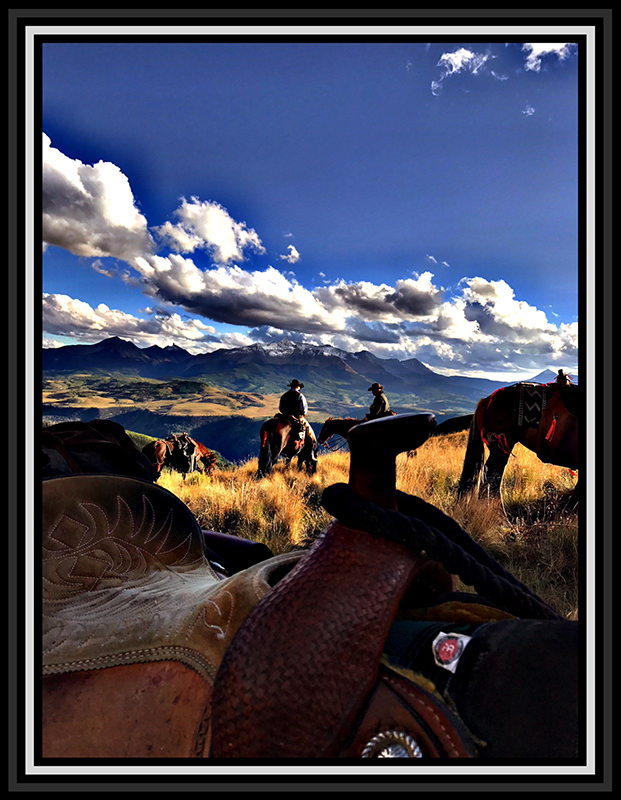 The image to the left was taken by one of Dave’s clients while on a hunting expedition for Eagles Nest Lodge. Roy began fishing when he was just six years old, and got his first BB gun rifle when he was 4. He shot pests around the family home located between Hotchkiss and Paonia, Colorado where he was born and raised. Roy’s father and grandfather started taking him hunting when he was about twelve years old. Roy started using a .243 Savage 99, which had belonged to his grandfather, Howard Jackson. He shot a coyote and his first doe with the .243 while hunting one day on the river bottom below his home. When he turned 14 he got his first compound bow, and he was given a .270 BLR which he used to shoot his first cow elk. He started pheasant and duck hunting about the same time. Roy shot his first bull elk on J Creek when he was 16 years old. During these years he also learned to field dress game by watching his dad and grandfather, and also learned to process wild game with his family. Roy has continued to perfect these necessary skills throughout the years. Hunting, fishing, shooting. and an overall enjoyment of the outdoors has been an extremely important tradition for the Jackson family for generations; one that has helped to shape strong, loyal relationships between family members, strong ties with private property owners, and lasting friendships with other hunting enthusiasts from all over the United States. Roy and his dad have now handed the knowledge and skills of hunting from the generations of hunters before them down to Roy’s son, Tyler, and step daughter, Chase. Due to the hunting knowledge and skills developed through five generations, the Jackson family has never gone without wild game, which has always been their primary source of meat throughout their lives. In addition, this hunting tradition continues to mold and strenghten the bonds within the Jackson family, while offering the welcome opportunity to grow friendships with property owners, and other hunters and their families. Book Your Hunt with Jackson Outfitters ➼ Contact Roy Jackson today!